Everyday can be a journey. Trails, streets, roads and the vehicles that traverse them along – from sports cars via 4x4s and campervans to Bullis - with portraits of their proud navigators are featured in this beautifully illustrated coffee table book. A romantic ode to the life on the road and an advocacy for pursuing the path off the beaten track in book form. 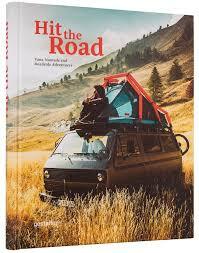 The motivation and stories behind the nomads that are portrayed are what makes Hit the Road: How they planned their trips, the detours and complications hat lead them to discoveries, how they prepped their vehicles culminating in detailed depictions of the stops and destinations. Opulent photography frames the stories and sets them in scene, geographically as a diverse as it can get, i.e. from the South of Europe to the deserts of Africa to the plateaus of Mongolia and everything in between. Anyone with a bit of love for distant and uncharted places would not want to do without this beauty and for the ones not infatuated with travel yet, can find the necessary inspiration: The quintessential of Hit the Road is that at the end of the day, all you need is the plan, a map and the courage to press on to your destination and enjoy the ride and everything that comes with it.